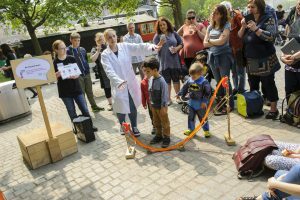 This September, Soapbox Science London will have a new and exciting element! Who is a scientist and who is an artist? Can the work someone in a lab coat is doing relate to a painting, or a dancer, or be understood through music? The new project aims to bring science to arts fans and art to scientists. By challenging artists and scientists to work together, Soapbox Art & Science will bring difficult science concepts to the public in exciting, innovative and engaging ways. 12 of the UK’s leading women in science will take to their soapboxes to showcase their science to the general public, alongside some amazing local artists. The new Soapbox Art & Science 2017 event will capitalize on Soapbox Science’s current strengths to widen the audiences exposed to science carried out by women and will facilitate communication and collaboration between the arts and science communities. We couldn’t run this London event without the generous logistical and financial support of our sponsors. Since 2014, our overall whole initiative is supported by the Science and Technology Facilities Council. We are very grateful for their financial support of the new Soapbox Art & Science project. We are very grateful for the support of Overleaf who have sponsored the London Soapbox Art & Science event 2017. Founded in 2012 and with over 600,000 registered users, Overleaf is an academic authorship tool that allows seamless collaboration and effortless manuscript submission, all underpinned by cloud-technology. By providing an intuitive online collaborative writing and publishing platform, Overleaf is making the process of writing, editing and publishing scientific documents quicker and easier. Researchers and academics can now write, collaborate, and publish with a single click, directly from the Overleaf web-app. Publishers and Institutions are partnering with Overleaf to provide customized writing templates, simple reference tool linking, and one-click publishing submission links. Visit the website and follow @overleaf on Twitter. Are you passionate about science and love talking to people about it? Do you want to help raise awareness about gender equality in science careers? Soapbox Art & Science London is looking for volunteers to help out at their event on 16th September 2017! Join us for an afternoon of fun, informal and inspiring art & science and help challenge ideas about who can be a scientist!